Led by a PhD candidate at the University of Sydney's School of Geosciences, researchers used the Southern Hemisphere's most highly integrated supercomputer to reveal flow patterns deep in the Earth's mantle - just above the core - over the past 100 million years. The flow patterns explain how the enigmatic bend in the Hawaiian-Emperor seamount chain arose. True to the old adage - as above, so below - the Sydney-US collaboration found the shape of volcanic seamount chains (chains of mostly extinct volcanoes), including Hawaii, is intimately linked to motion near the Earth's core. The findings of PhD candidate Rakib Hassan and fellow researchers including Professor Dietmar Müller from the University's EarthByte Group, are being published in Nature. Mr Hassan explained: "Until now, scientists believed the spectacular 60° bend in the Hawaiian seamount chain - not found in any other seamount chains - was related to a change in plate motion combined with a change in flow direction in the shallow mantle, the layer of thick rock between the Earth's crust and its core. "These findings suggest the shape of volcanic seamount chains record motion in the deepest mantle, near the Earth's core. The more coherent and rapid the motion deep in the mantle, the more acute its effects are on the shape of seamount chains above," he said. Although solid, the mantle is in a state of continuous flow, observable only over geological timescales. Vertical columns of hot and buoyant rock rising through the mantle from near the core are known as mantle plumes. 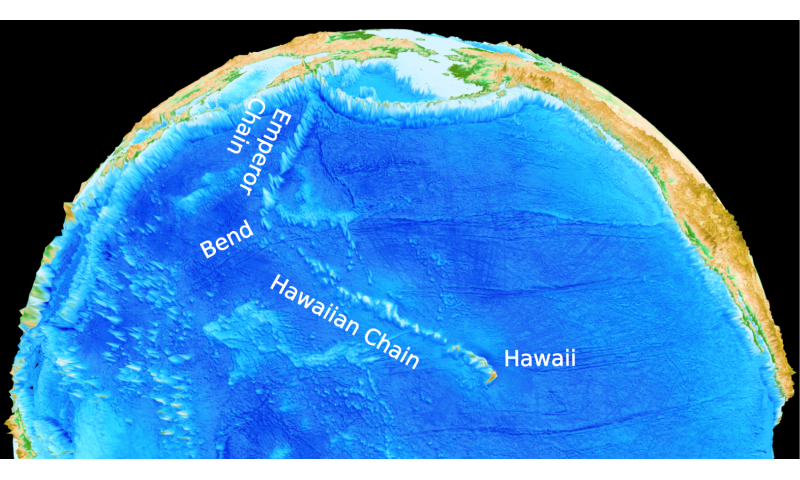 Volcanic seamount chains such as Hawaii were created from magma produced near the surface by mantle plumes. Moving tectonic plates sit above the mantle and carry newly formed seamounts away from the plume underneath - the oldest seamounts in a chain are therefore furthest away from the plume. "We had an intuition that, since the north Pacific experienced a prolonged phase wherelarge, cold tectonic plates uninterruptedly sank into the mantle, the flow in the deepest mantle there would be very different compared to other regions of the Earth," Mr Hassan said. One of the most contentious debates in geoscience has centred on whether piles of rock in the deep mantle - to which plumes are anchored - have remained stationary, unaffected by mantle flow over hundreds of millions of years. The new research shows the shapes of these piles have changed through time and their shapes can be strongly dependent on rapid, coherent flow in the deep mantle. 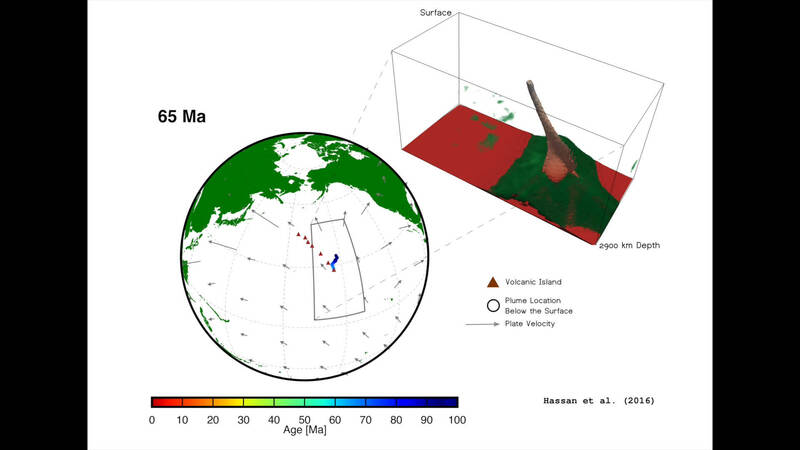 Between 50-100 million years ago, the edge of the pile under the north Pacific waspushed rapidly southward, along with the base of Hawaii's volcanic plume, causing it totilt. The plume became vertical again once the motion of its base stopped; this dramatic start-stop motion resulted in the seamount chain's sharp bend. Using Australia's National Computational Infrastructure's supercomputer Raijin, the team created high-resolution three-dimensional simulations of mantle evolution over the past 200 million years to understand the coupling between convection in the deep Earth and volcanism. Mr Hassan said the simulations were guided by surface observations - similar to meteorologists applying past measurements to predict the weather. "These simulations required millions of central processing unit (CPU) hours on the supercomputer over the course of the project," he said. Professor Müller concluded: "Our results help resolve a major enigma of why volcanic seamount chains on the same tectonic plate can have very different shapes. "It is now clear that we first need to understand the dynamics of the deepest 'Underworld', right above the core, to unravel the history of volcanism at Earth's surface," said Professor Müller. The paper, 'A rapid burst in hotspot motion through the interaction of tectonics and deep mantle flow', will be published this week in Nature.